ደጀ ሰላሞች እንዴት አላችሁ? እንደው እንደስማችሁ የሚሆን ዜና ጠፋ አይደል?! ምን ይደረግ። የዘመን ቅራሪ! እግዚኦ ወዴት እንድረስ ይሄንጉድ የማንሰማበት የማናይበት የትኛው አለም ይሆን ከዚህ የበለጠ ምንእስኪያደርጉ ነው ይሄንሰውየ የምጠብቃቸው ምንፍቅናቸውን ለማረጋገጥ ምንድነው ማየት የምንፈልገው ነው ወይስ ማይክ ይዘው እኔተሐድሶነኝ የሱስ ጌታነው እስኪሉ ነው አየምንጠብቀው እናንተስ አባቶች ሊቃውንተ ካህናት እና የየክፍለሀገራቱ ሀላፊ የሆናችሁ ፓፓሳቶች(የሲኖዶስ) ተወካዮች ወይም አባላቶች ከዚህ በሁዋላ እንዴት ብላችሁነው ከዚህ ሰውየ ቡራኬ እየተቀበላችሁ ስራየምትሰሩት እንዴትስብላችሁ ነው ለጥፋታቸው(ለምንፍቅናቸው) ፍጥነት የምትራዱዋቸው ለምን አውግዛችሁ ለህዝቡ እውነቱን ተናግራችሁ አይለይልንም እሽሩሩው አይበቃም ቤተክርስቲያንን በሰላም እንካፈል ብለው እስኪጠይቁን ነው የምንጠብቀው? 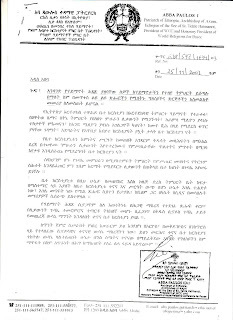 Emebetachen ye aserat bekurat hagerwane(Ethiopian) tebarekelen. Amelakachene Medhanialem Kirstose Kedeste Betekerstianachene Ena Hagerachenen Yetebekelen.Amen!!! Egiziabehere hoye Betchrstianene ke tehadeso menafikan ena ke tebabariwoch tebikilen. Le sewoch lebona sitachew. Wondimoch ena ehitoch, Egziabher negerun hulu eyegeletew new. Beye atibia betechristianachin bertiten enitseliy. Besimet megodat sayihon hulum atibiawun lalemasidefer yitebik. Beyalachihubet bota hulu sibseba eyaderegachihu tewoyayehu. Semaetinet litebekibinim yichilal. Egziabher gin legna yan ayisetenim, keseten gin wodehuala malet ayigebanim. Kebetechristian lela minim neger yelenim ecko. Yebelete gin lehizb enasawuk. Egziabher kegna gara kale man yikawomenal! Woladite amlak tirdan! Let Z Permanent Sinod take Z Mandate here! I am writing this while I am deeply crying after reading this article. I was amazed for long time why the patriarch kept silence when all these things happen to the church, I thought he is the leader and whom he was waiting. He should have given some explanation on each of the issues but kept silence? why he start talking when the people are against tehadiso? to conclude that there is something. It has been known that he is not genuine papas for long time.I am sure God will not punish me by saying this because I believe either he is not blessed papas or he is not papas from God at all. It has been well said in the bible that you will know true spirituals by their performance and nothing from him shows he is even spiritual. 1.Pray for God everyday regarding ourselves and the church and remember your church by crying. and circulate the information as much as possible.And learn and know the church well, listen to sermons and lessons and be strong on spiritual life. 3. Discuss every single issue regarding church and individuals messing the church and keep it for the Holy synod. 4.continue collecting information and share it. 5. protect the church in each of our friendships, Sunday schools and individually and any other groups. God is making them to express themselves. 8. Do not lose hope ,remember of semaitat, tsadikan, kidusan. Please put pressure on them by praying and challenging.Use your different spiritual and other skills to get rid of all this devil's work from the church. Abet Amilak tigistu? Mechem gizewu sideris Bete Yekemagnochina Yekehadiwoch Ayidelechim bilo jirafun yanesal. Yetewahedo Lijoch Yemetawu fetena kelal ayimesilimina esti Berititen Enitseliyi. Yekidusan Amilak be Hayimanotachin Yatsnan!Silekedemut Abatochachin bilo Betekirstianin yitadegilin! Enalikis.........wede Fetari! Ere Gobeze Mendenew Negeru. "Aba" "Abune" or Pastor Paulose leyelete.Aba paulosem hune yetegawem ye mengeste akale endiaweke yemiasfelegew.Le Kedeste Betekerstianachen Sematenete Lemekebele whulachenem Yetewahedo Legoche Zegu Nene.Betekerstianachen lay,Hezbu lay Gefu Bezaaaaaaaaaaaaaaaaaaaa.Bezihu Ketelu Wetetu Enayalen.Egziabhere Amelake Kedeste Betekerstianachene ena Hagerachenen Tebekelen. I don't know how long this man stays in power, for me he is no more the church leader, he is pure protestant , his goal is a gradual reformation of the EOTC to the evangelical church. Aba gebremedihin you can be a good protestant church preacher and leader why don't you go where you belong? This is the first time in my life the church leaders are asserting their authority towards an important issue. It is not whether I agree with the decision or not, or the person in charge. The office has to be respected no matter who is in charge. I do not want the church to be led by a bunch of fire age youngsters. Our fathers have to be in charge. If they keep doing such curagious decision again and again, it would be good for the church. Imagine if we do not have papasat, we will be like any other protestant church. Please our papasat try to stand for the truth no matter where it takes you. Our lord said do not be afraid of those who can kill your flesh but not your soul.. I THINK IT IS TIME. 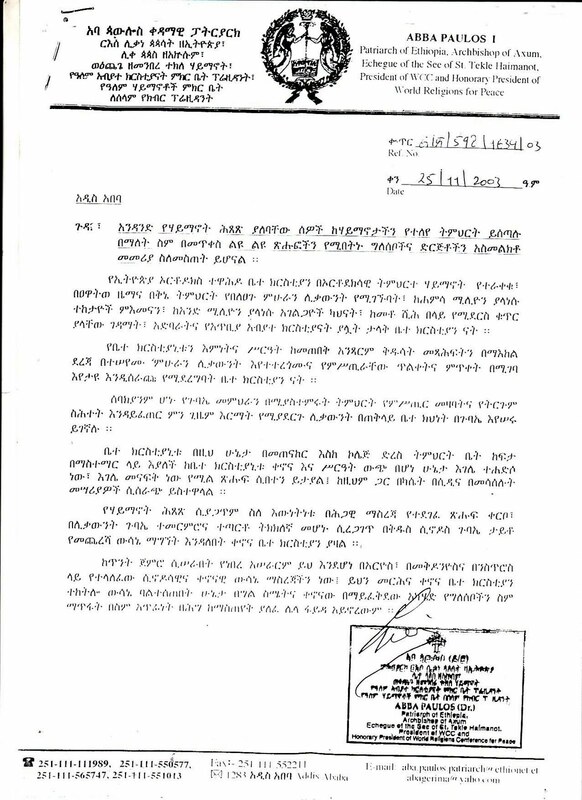 What I understand from Aba Paul letter regarding Begashaw's job assignment is that he agreed with what his davilish son (Begashaw) wrote on his phamphlet "Yemesqelu sir kumartegnoch", because I think it was realy his picture. 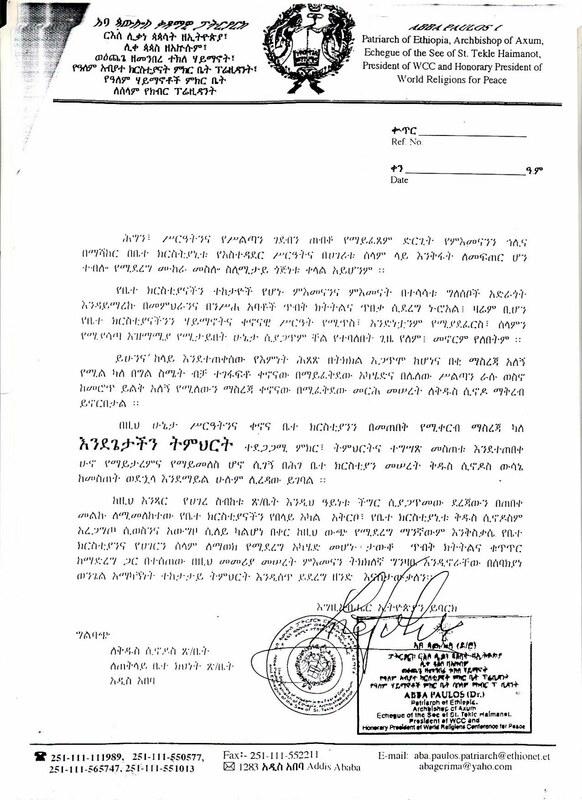 Aba Paulos lay tesfa kekorethu betam koyichalehu! Dejeselam:- Gin meche yihon "Aba Paulos" ena "Motu" yemilutin kalat be Seber Zena yemtasnebibin? Adera "Arefu" endatiyin. "Ereft" bego sertewu lemihedu newu. Betam fetagn yehonu Kifu Menfes yaderebachewu ... edle bis sewu nachewu. LE ETHIOPIA ORTODOX TEWAHIDO TEKETAYOCH BEMULU!!!! EGIZIABIHERIN BETSOM BETSELOT ENTEYIKEW ERSU YIMELISILINALINA ABIZITEN MAWIRAT TITEN ABIZITEN ENALKIS SUBAE SUBAE SUBAE EMEBETACHIN BEMILJAWA ATILEYENIMINA ENALKIS ENALKIS!!!!!! 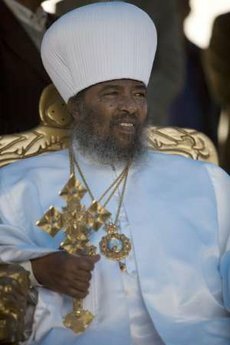 Please abun paulos leave the church.Ebakwoten yemnesetew birr yelenem, yemnzerefelew keni yelenem.Ebkuwten lebonawoten legizabheir yasgezu.Sel hymanot new eytenegagren yalenew plotica aydelem.Wadedum telum Tewahido Atetadessem.Tetadess kalum bedemachin laye yihonal. I think this reveals sufficiently how Aba paulos is working hard to distroy the church. Now we should be vigilant, brothers and sisters! And be ready to pay whatever sacrifice there may be in front of us. Remember the 8,000 farmers of Gonder who gave their lives to protect their religion in one day. At that time it was the king (Susnios), but now it the head of the church who is leading the church distruction, which makes it much worse. 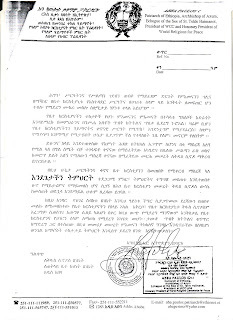 Egizo Amlak Ante Betekiristianin Asalifeh lepaulos giragne tisetat yemiyasazin newu kezih belay min eskihone endemintebik ayigebagnim engidih lehaymnotachin yekomin kohene wode giziyabihere betsome betsolot eyetegan betekiristianin lemetebek lemesuwat beandi yemininesabet gizie newu beka enbel beandi lay. ewunetegnochu kidusan abatochim shekimun kerasachihu awuridu kuritun nigerun kegonachihu nen. Now it is the time to pray and fast exhaustively but b/c everything what our holy prophets said had happened clearly. Those who betrayed their original and true religion will do whatever they can b/c they are controlled and run by their master the DEMON.But they will not be successful b/c they are fighting with our father God. Still then we should be faithful and live in fair, pray day and night for our selves, the country ,the people and our beloved EOTC. NOW it is the TIME to face the BIG CHALLENGE. You are our power, wisdom, and way! Provide us unity to stand together to throw away the heretics from our holy orthodox tewahedo church! I hope the Patriarch will gain his conscientious to stand with the truth, not with the enemies. Otherwise, time will show where he will endup! May the God of the prophets, saints, and apostle safeguard our church! Abune paulos is doing like what king Susinios did on our church. Susinios tried and many people became martyrs. But our church was maintained. The Italians have also tried and thanks to the martyr bune Petros,Ethiopians have shown their devotion to God. Likewise, Abune paulos is sharing their history. There might be some sacrifice, but our church will not be renewed forever. We have to renew our christian life not the Dogmas and kenonas. Let's continue alarming our fellow christians about the situation. Amlake-Egziabher, kekidist enatu gara ayileyen! abatoche,enatoche,wenidimoche ena ehitoche lemindinew erasachin yeminatalilew esike -ahun diresis aba gebirmedihim man endehonu sanawik kerten ayimeslegnim,rasachin eyatalelinew weyim sigachin ewinet lemenager sileferachi yimeslegnal. ahunim giziw alimeshebinim bezuriachin yemigegnewin maniyawinim kebetekirstianachen wiche yehonewin hulu eyeteketatelin berasachin tiret betekirstianachin betibik metebek yenorbinal.ewinetegnawin timihirt meleyet yasifeligenal. KE Patriariku meglecha yeteredahut TEHADSO wede terakeke dereja derese malet new.Le Rekik awre ebab TEHADSO yerekeke slt yemitykbet gize endehone yamelaktal. "Jib kallefe wusha chohee yibaalaal"
Too late to we wake up after 19yrs and 99hr were we was when EOTC missed up mikiniyatuum Israeal MERII BAALNEBERAT GIZEE hizbuu befiituu yewededwun yaderg neber hulum tikikil yimesilewu neber indihu EOTC LEE 19 AMET MERII ALNEBERATIM MALET YICHAALAL.KANTU MEMERIA INA CHUMET NEWU. Hataa'uu jedhe jaldeessi dhagaa galagalchee jidhani" maaliif laata ? A mob (both inside and outside Ethiopia)has to be made against the so called Tagay Paulos. After that, we Ethiopians will restore the former (real)faith of Ethiopians. This is the right time to overthrough the Catholic but Ethiopian Orthodox leader. የሚዲያዎች ትኩረት ማ/ቅዱሳንን ይጎዳዋል ወይስ ይጠቅመዋል?